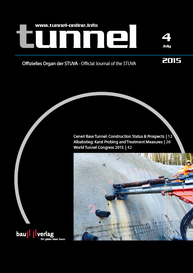 As part of its strategy to further enhance tunnelling and underground space awareness on an international level, the International Tunnelling and Underground Space Association (ITA) launched its own Tunnelling Awards program in March 2015. Since the registration opening on 10 April, fifty candidates have applied. A short-list of pre-selected projects will be officially presented in September 2015. The preselected candidates will ensure a presentation of their projects on 19 November 2015, date of the Prize Awards Ceremony, during a one-day conference at the Hagerbach Test Gallery in Flums Hochwiese, Switzerland. The winners will be announced during a banquet the same evening. 18 judges, experts in the tunnelling industry, will form the jury: Søren Degn Eskesen, Chairman of the Board and ITA president (Denmark); Han Admiraal, ITACUS chair (Netherlands); Andre Assis, ITA past-president (Brazil), Zaw Zaw Aye, ITA expert (Thailand), Mikael Belenkiy, ITA expert (Russian Federation), Tarcísio Celestino, ITA vice-president (Brazil), Heinz Ehrbar, ITA WG 19 animateur (Switzerland), Amanda Elioff, ITA vice-president, Simon Knight (Australia), Martin Knights, ITA past-president (United Kingdom), Tom Melbye, ITA expert (Finland), Harvey Parker, ITA past-president (United States of America), Dominique Perrault (France), Andreas Tauschinger (Qatar), Shani Wallis (United Kingdom), Jenny Yan, ITA ExCo member (China), and Chung-Sik Yoo, ITA WG 2 animateur (South Korea). Registration for the conference and the banquet on Thursday, 19 November, will open in July. The one day conference will focus on the short listed projects and initiatives. The detailed program will be available in September, once the jury has selected the candidates for the shortlist in each category. The application for candidacy is opened online until 14 August 2015.